Join us on Sunday, March 10th for a 5k run/walk or 10k run along Jericho Beach. All proceeds go directly to support Hope Air (https://hopeair.ca/), a charity that provides Canadians in financial need with free travel to medical care far from home. Register now at https://www.events.runningroom.com/site/16062/run-for-rural-medicine-2019/?fbclid=IwAR3uvZdtKtaiCTr1OiFVqIOsHa8gyilCT5g7e0SWbblS9qVPljFNasET3mA Make sure to sign up before February 11th for a free shirt! Looking for other ways to get involved? We are always looking for volunteers to help out at the run! 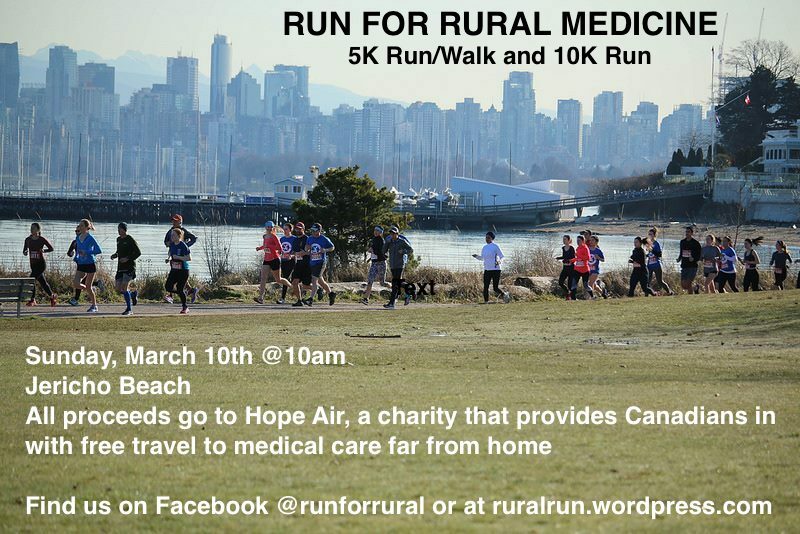 Please reach out to ubcmed.ruralrun@gmail.com. In addition, you can donate to Hope Air through the registration page, and 100% of your proceeds go directly to support this amazing organization. As this run is organized on a not-for-profit basis, we count on our community sponsors to make this run possible. For sponsorship inquiries, please each out to ubcmed.ruralrun@gmail.com.